​Prestera Foundation's annual Spring benefit will be held on Saturday, March 4th, 2017 at the Don Morris Room of Marshall University's Student Center in Huntington, WV. 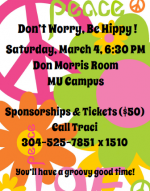 The theme is "Don't Worry Be Hippy Fundraiser" featuring a reception, dinner, auction, raffles, live band (Caught Red Handed) and plenty of fun. Business sponsorships are available as are individual tickets - contact Traci at (304) 525-7851, Extension 1510. Make your reservation early, we expect another sell-out. Thank you for your support.